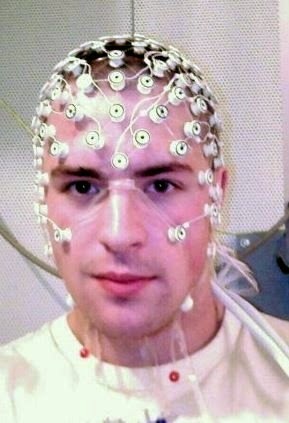 Had my EEG this morning. I won't subject you to further play by play because that went on for awhile. Next up was the hyperventilating portion of the morning. Deep Breathe in/out, fast, over and over for 3 minutes. I was getting pretty lightheaded by the time he told me to breathe normal again. After all that hard work, I suppose they felt you needed a rest, because the next segment just had you lying quietly and even trying to sleep. I made a valiant effort to sleep, but it was no use. I was just lying there thinking the most endless array of weird thoughts. - "How still does lie "STILL" mean? Will the test be a bust if I scratch my nose?" - "Now my right toe itches"
- "Should I be making conversation?" It's impossible to keep track of time and determine how long had passed. 10 minutes? 20 minutes" It felt like forever and I really did have to scratch my nose. He then informed me we will be moving on to the strobe light portion of the test. Up until this point I have been lying in darkness with my eyes closed. He then rolls this strobe light in front of my face, flicks it on and tells me to open my eyes and stare at it. The light began to blink slowly only to pick up speed. Trying to keep my eyes open was really difficult when the light was so bright, especially after lying in the dark for a half hour. After the impromptu rave for one, we now reached the end of the test. Hurrah...cue nose scratching. He flicked on the lights and without looking up informed me that the electrode gel, aka pomade, rinses off in water. He then took off all the electrodes, which released at the slightest yank of the wires. As I got off the stretcher, he looked at me and said "Uh, we have a mirror on the back of the door if you'd like to fix your hair"
That was my first indication that I had hobo chic going on. Still squinting from the dark to light transition, I walked over to the mirror and took a glance. Staring back at me was some form of sea witch... My hair was completely punked out with globs of this pomade concoction dotted throughout it. I went to wipe some of it off and it slicked my hair back like Elvis. So while I was planning on heading in to work straight after this appointment, I made a gmae time decision to go home and wash my hair. I'm not vain or anything, but there was just no way I could go to work like that, the "wet look" is not one that I can ever hope to pull off. Thankfully it all washed out with no problem and I was back looking like my regular non-electrocuted-Crystal-Gayle self in no time. Speaking of which I have an appointment at Sets on Corydon this Saturday. Bye Bye Crystal. Will hopefully get the EEG results in 2 weeks time and then we'll go from there.